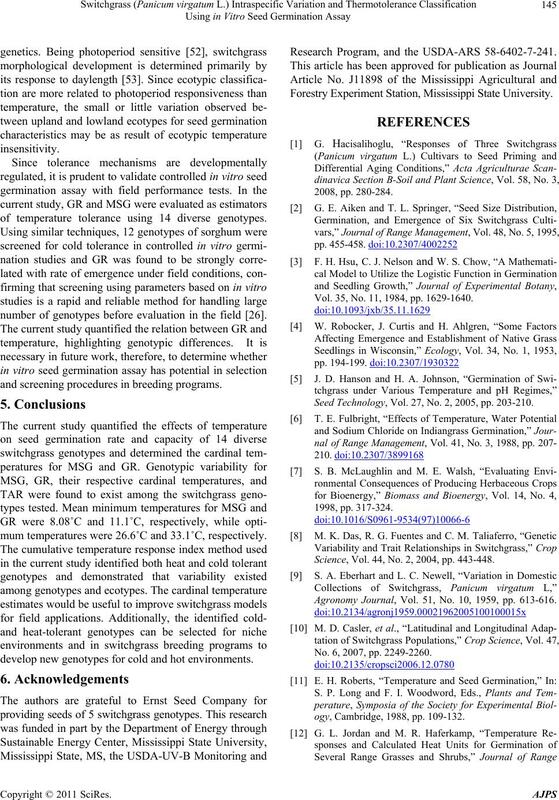 Received March 4th, 2011; revised May 9th, 2011; accepted May 17th, 2011.
switchgrass breeding programs to develop new genotypes for low and high temperature environments. and its ability to produce high yields and quality biomass. be necessary for adequate and uniform crop establishment. nation occurring within 3 d of imbibition at 29.5˚C . although it is suspected that there is intra-species variation. termined by principal component analysis [31-33]. Table 1. Ploidy level, ecotype, latitude, origin and plant hardiness zone (PHZ) of switchgrass ge notypes. Genotypes are classified based on ploidy level (T = tetraploid, H = hexaploid, and O = octaploid), and latitude of adaptation (S = southern and N = Northern). which induces secondary dormancy . coleorhizae was at least 2 mm long. time to 50% of maximum seed germination. Grate is the slope of the curve. nonlinear regression techniques for all genotypes . constants generated using PROC NLIN in SAS . 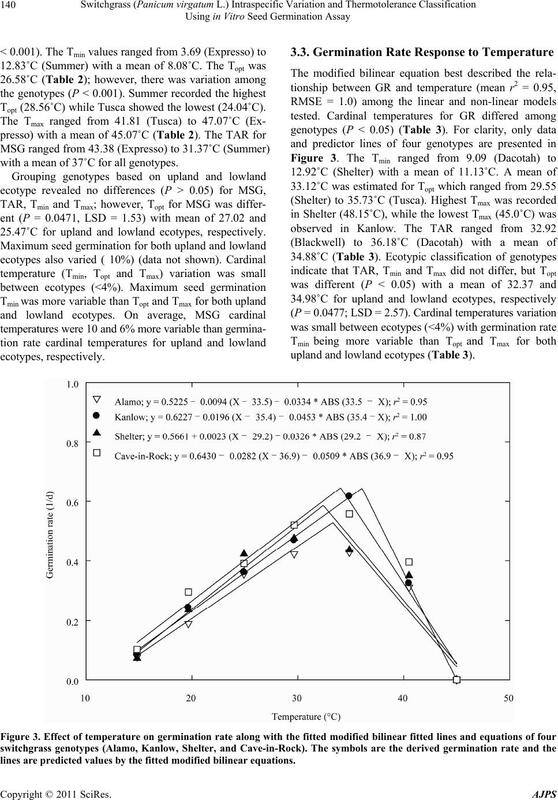 and heat tolerant (>minimum CTRI + 3 SD). differences (LSD) at P = 0.05.
percentages and the curves are fitted lines using quadratic functions. 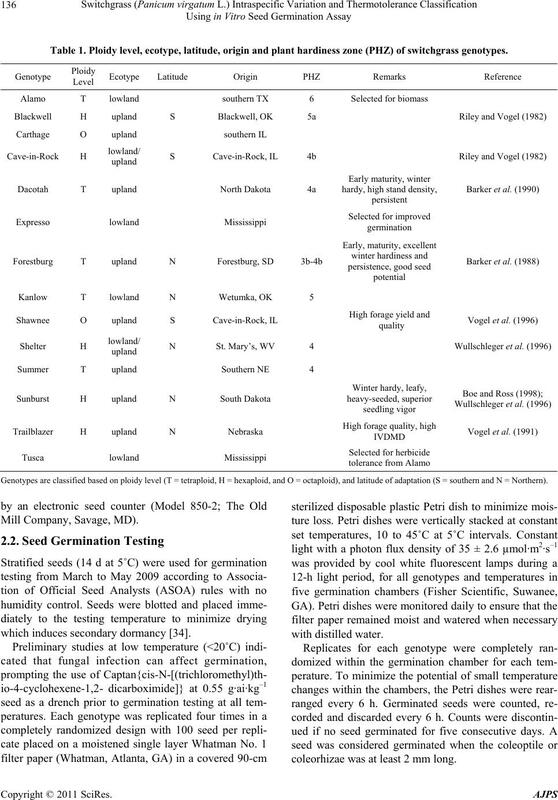 tion (MSG) of 14 switchgrass genotypes in response to temperature. *Significant at P = 0.05 probability level. Topt (28.56˚C) while Tusca showed the lowest (24.04˚C). 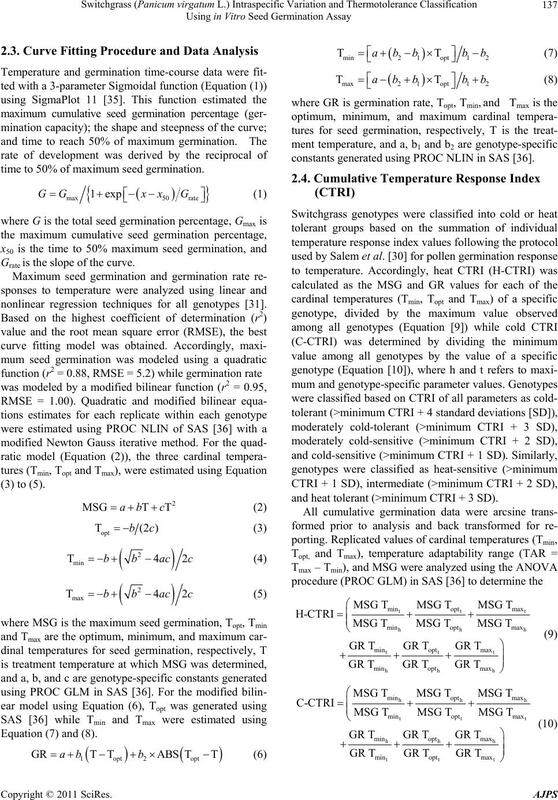 with a mean of 37˚C for all genotypes. upland and lowland ecotypes (Table 3). 25.47˚C for upland and lowland ecotypes, respectively. lines are predicted values by the fitted modified bilinear equations. 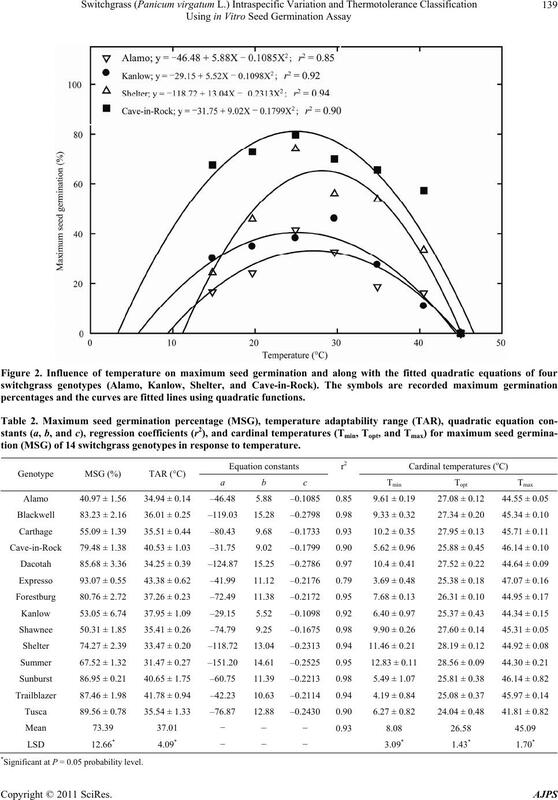 and cardinal temperatures (Tmin, Topt, and Tma x) for germination rate of 14 switchgrass genotypes in response to temperature. heat-sensitive genotypes (Tab le 4). 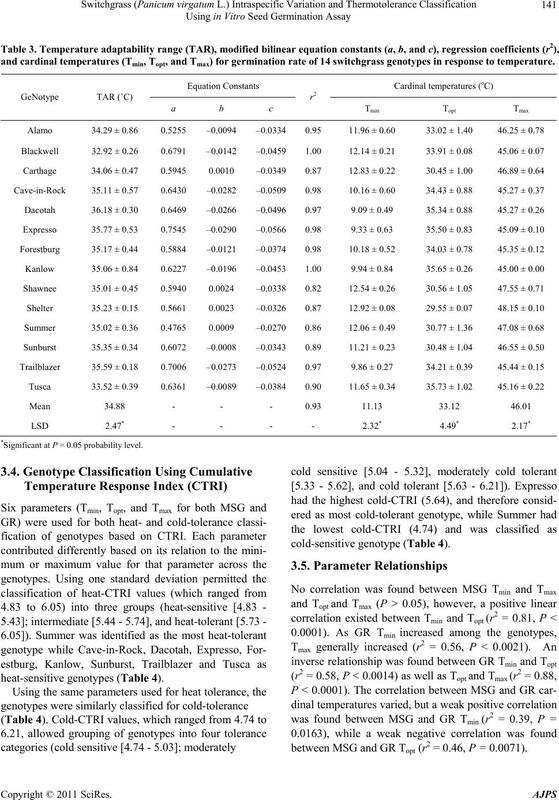 temperature response index (CTRI; unitless) along with individual scores in parenthesis. physiological pathways affecting cell expansion. conditions across these experiments are divergent. prairie sandreed (Calamovilfa longifolia (Hook.) Scribn.). that are responsive to temperature changes. mum temperature ranging from 29.5˚C to 35.6˚C. be used to describe the range of adaptation of a species. can be directly compared for screening germplasm . rithms for on-farm application and policy assessments. ism to cope with excessively high or low temperatures. lection or breeding among genotypes is a viable objective. 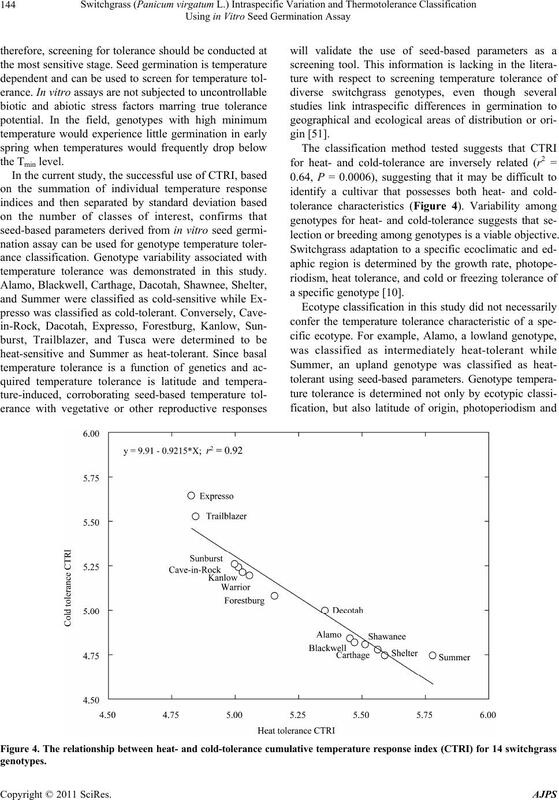 temperature tolerance was demonstrated in this study. 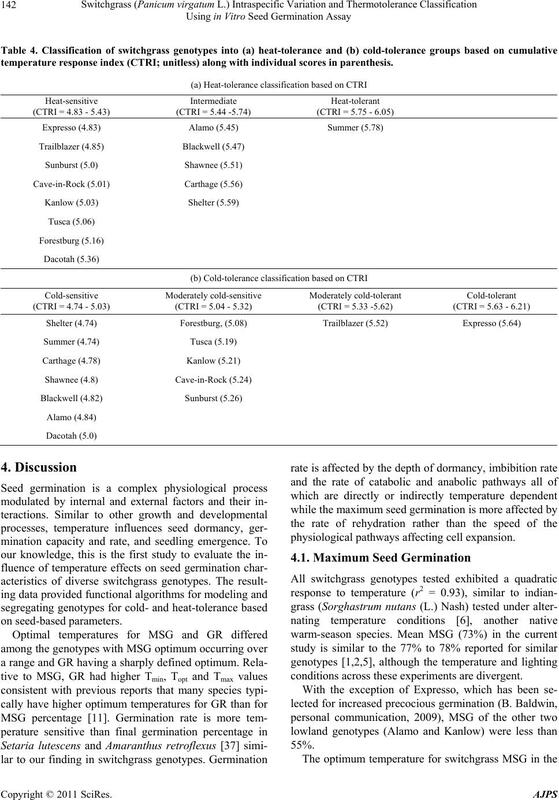 of temperature tolerance using 14 diverse genotypes. number of genotypes before evaluation in the field . and screening procedures in breeding programs. mum temperatures were 26.6˚C and 33.1˚C, respectively. 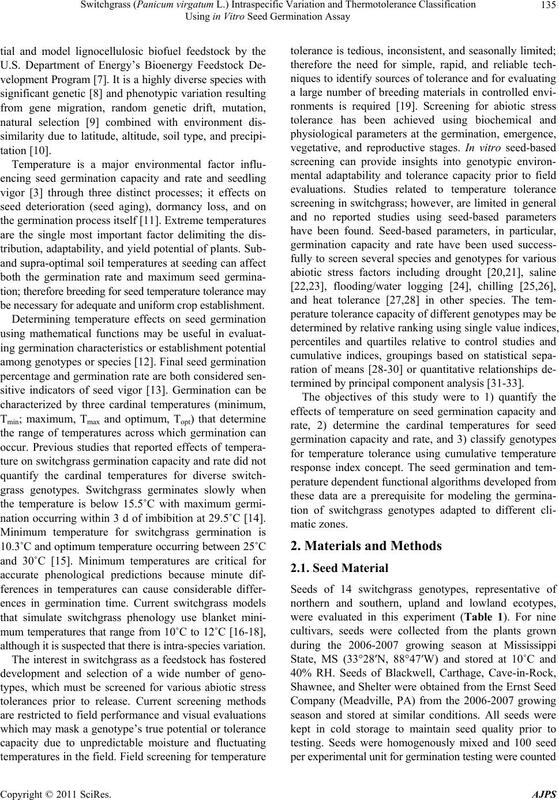 develop new genotypes for cold and hot environments. Research Program, and the USDA-ARS 58-6402-7-241. Forestry Experiment Station, Mississippi State University. Vol. 35, No. 11, 1984, pp. 1629-1640. Seed Technology, Vol. 27, No. 2, 2005, pp. 203-210. Science, Vol. 44, No. 2, 2004, pp. 443-448. Agronomy Journal, Vol. 51, No. 10, 1959, pp. 613-616. No. 6, 2007, pp. 2249-2260.
ogy, Cambridge, 1988, pp. 109-132. Management, Vol. 42, No. 1, 1989, pp. 41-45. Sciences, Vol. 24, No. 5-6, 2005, pp. 423-459.
age Grasses,” Crop Science, Vol. 25, No. 2, 1985, pp. Biomass and Bioenergy, Vol. 29, No. 6, 2005, pp. 419-425. Crops and New Uses, ASHS Press, Alexandria, 1999. pp. 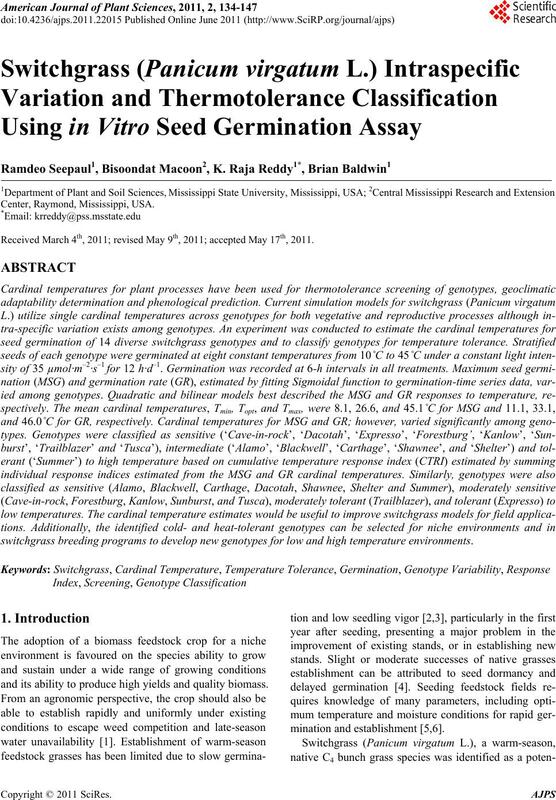 Journal of Agronomy, Vol. 23, No. 2, 2005, pp. 103-107. No. 5, 1984, pp. 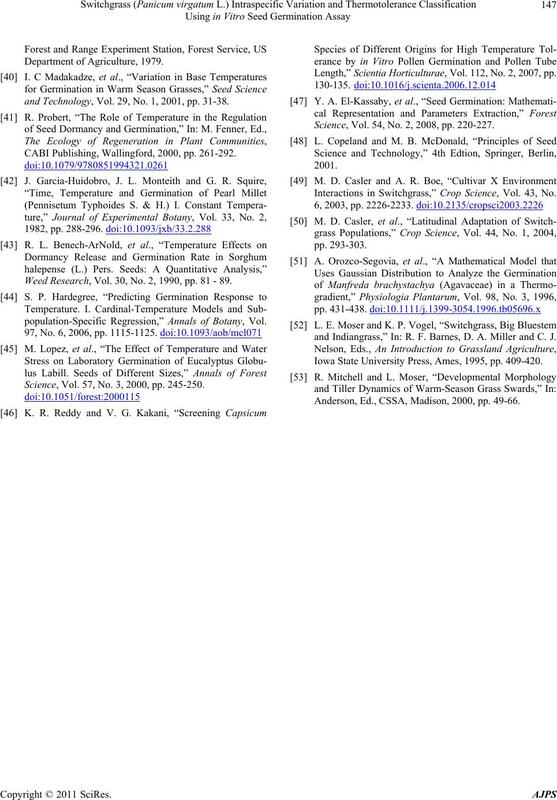 933-933.
dian Journal of Plant Physiology, Vol. 5, No. 1, 2000, pp. HortScience, Vol. 32, 1997, pp. 296-300.
ence, Vol. 166, No. 5, 2004, pp. 1135-1142. No. 3, 1992, pp. 447-453. Science, Vol. 63, No. 2, 1983, pp. 377-384. Vol. 19, No. 4, 1979, pp. 553-553.
of Botany, Vol. 94, No. 6, 2004, pp. 855. 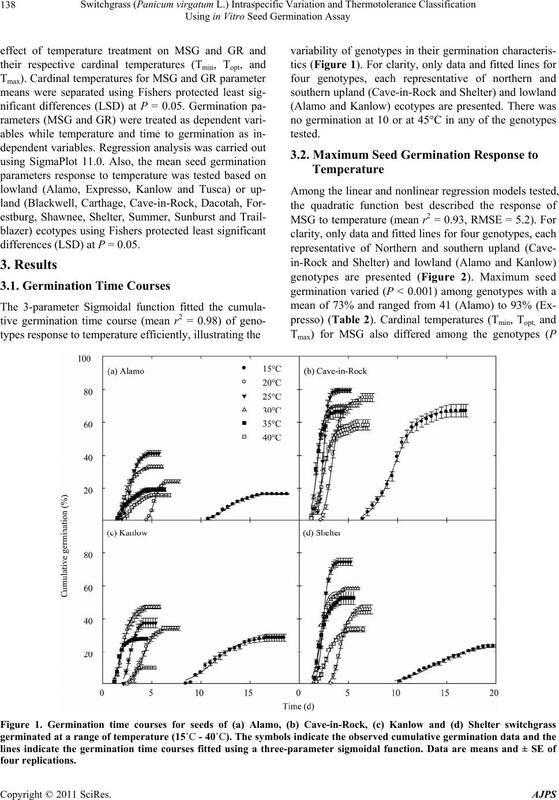 Genotypes for High Temperatures,” Crop Science, Vol. 47, No. 1, 2007, pp. 219-231. Environment, Vol. 25, No. 12, 2002, pp. 1651-1661. 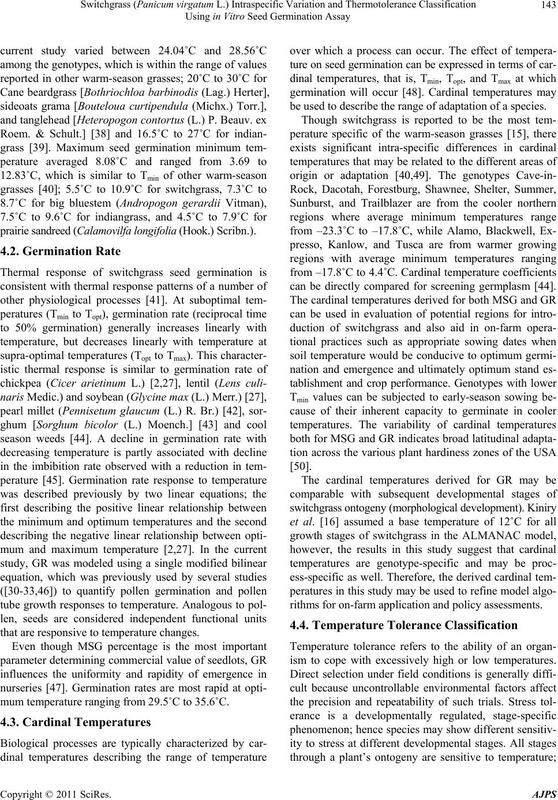 Response to High Temperature,” Annals of Botany, Vol. and Crop Science, Vol. 194, No. 3, 2008, pp. 225-236. Reversed and Hastened by Drying,” Crop Science, Vol. 41, No. 5, 2001, pp. 1546-1551. 9.1.3.” SAS Institute Inc., Cary, 2004. Annals of Botany, Vol. 41, No. 6, 1977, pp. 1357-1360.
and Technology, Vol. 29, No. 1, 2001, pp. 31-38. CABI Publishing, Wallingford, 2000, pp. 261-292. Weed Research, Vol. 30, No. 2, 1990, pp. 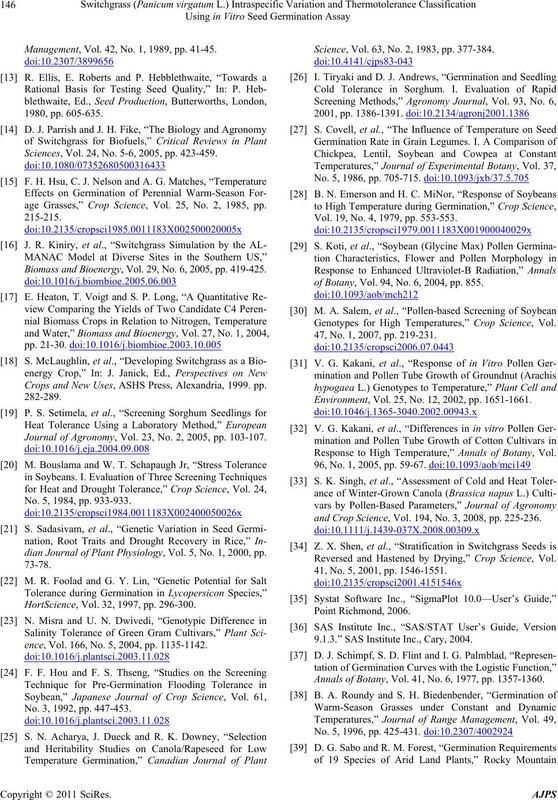 81 - 89.
population-Specific Regression,” Annals of Botany, Vol. Science, Vol. 57, No. 3, 2000, pp. 245-250. Length,” Scientia Horticulturae, Vol. 112, No. 2, 2007, pp. Science, Vol. 54, No. 2, 2008, pp. 220-227. Interactions in Switchgrass,” Crop Science, Vol. 43, No. and Indiangrass,” In: R. F. Barnes, D. A. Miller and C. J.
Iowa State University Press, Ames, 1995, pp. 409-420. Anderson, Ed., CSSA, Madison, 2000, pp. 49-66.